Sugar Land Rotary honored Fort Bend ISD’s 2013 Rookie Teachers of the Year during a Teacher Appreciation Day recognition program held at a recent Rotary meeting. Rotary has recognized exceptional first-year teachers through this recognition program for more than 17 years. Sugar Land Rotarians welcomed the teachers and their campus administrators to the event, expressing their gratitude to these young adults as they begin their education careers. Dr. Phillys Hill, FBISD Assistant Superintendent, introduced each honoree. The rookie teachers then shared why they became a teacher and what they have enjoyed most about their first year of teaching. Honored were: Margaret Bennett, Austin Parkway Elementary; Jennifer Culberson, Highlands Elementary; Ashley Forde, Lakeview Elementary; Kristin McNeely, Baines Middle School; Alonzo Ford, Bowie Middle School; and Lynsey Wallman, McAuliffe Middle School. They each received a gift card from the Rotary in appreciation of their outstanding efforts as first-year teachers. 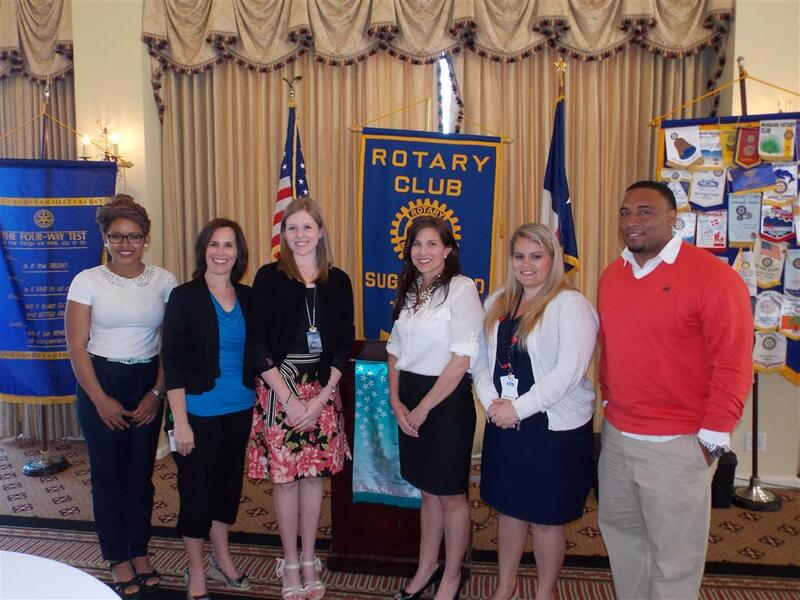 Pictured at the Sugar Land Rotary teacher recognition are (from left to right): Ashley Forde, Jennifer Culberson, Margaret Bennett, Kristin McNeely, Lynsey Wallman, and Alonzo Ford.